Another kinda Vista skin. Just like my Ecliz, I mixed some blue & smooth-feel style and high-tranz window borders. 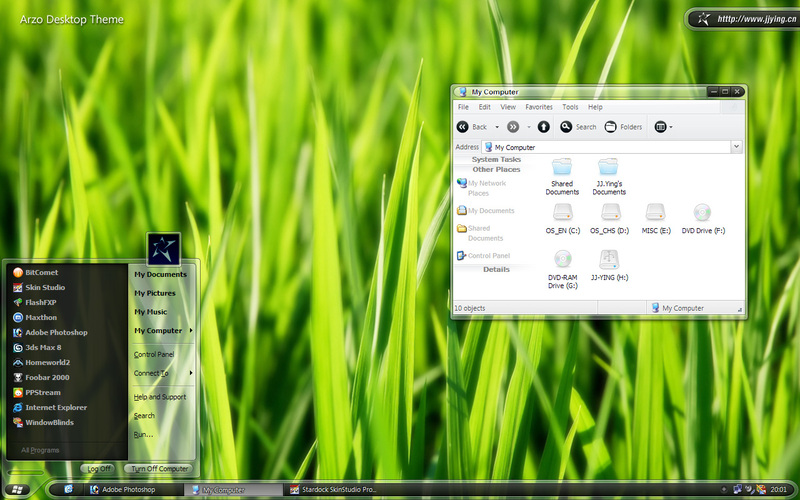 Also I tried some new taskbar/taskpanel in this skin. All features supported, including toolbar icons and system animations. I really, really like this on JJ. Thanks again for a wonderful blind. The Best WB Skin I have seen in a while!!!!! Truly awesome!! Does it come with a compact sub style for the start menu? Absolute Quality; just like Ecliz is. i like the direction! the separation of the start menu is cool. In general, I think the vista influence is cool, just would like to see a bit more color along with the transparency. But of course this is an excellent skin in a sea of mediocre ones. Thanks!!! Nice take on Vista JJ.. Being a seller of Digital Content though you may want to hide the Torrent app from your start menu for your screenshots. Just some advice I am passing along from an old friend. Great style and design, using it now and I love it! great skin JJ , i do hope you'll make some other substyles for this skin , with different start buttons , as the black and white is just to dull for the already transparency of this skin imo. still all that said , it's top quality work for sure. Great skin, like the startbutton. Nice and has some really fresh ideas, but there's alot of little things going on that just don't quite work right, great job overall. Love it! Using it now. It's more than good enough for this old fart! Hi JJ, I actually used this theme for a while today, just wanted to make you aware of a few things I noticed. Is there not supposed to be a Maximized titlebar? All i see in SKS is a borderless horizontal gradient. Looks bad, like the bar is missing or cuttoff when maximized, also when two windows are maximized the titlebar text bleeds thru. Also The Right Click > New or Photoshop menu's mousover state has a really bad text shadow. Icons in places panel are off. and the disabled dropdown buttons look unskinned, just a white box. I provided screenies for you. Hope you can get these things fixed, I realize this is not a pay skin but a couple of these things I would expect better of..from a Master. If you make your icons 32 they don't show up in the places panel and it looks fine. My 2 cents. It's still a 5 star skin to me! I second the motion made by vStyler. I've got the same things going on over here, plus, the placement of the arrows ( >> ) for my quick launch on the taskbar sit high and look mis-aligned against the taskbar itself. Otherwise this is a beautiful skin and would love to see these minor problems corrected. Keep up the good work and thanks for sharing!